This is the first post of a three-part series exploring the relationships between freshwater and transport in Auckland. The aim of the combined series is to demonstrate how Auckland could seize the opportunity to build resilient water infrastructure at the same time as addressing transport issues, and to provoke discussion. What does ‘freshwater’ mean to Aucklanders? How do we interact with it? We cherish our beaches, fishing and marine areas, but how much do we know about the natural arteries within our urban boundaries? This first post investigates the historic state of Auckland’s relationship with freshwater, legacy water quality issues, the conflicting ecosystem services that exist and asks questions about how we interact with freshwater. The second instalment will look at the concept of the water sensitive city1, explore how infrastructure installed within the last twenty years is adopting ideas and practices that are the first steps towards achieving such a concept, and how the freshly updated National Policy Statement for Freshwater Management2 may influence management of our freshwater resource in the near future. The third post will then look at our current transport paradigm and how transition to a low-carbon rapid-mass-transit system could provide tangible water quality benefits. Together, streams, rivers and groundwater constitute the freshwater realm. Water covers 71% of earth’s surface, but freshwater constitutes less than 3% of this and less than 1% is readily available. Across the world, freshwater provides drinking water, transport routes and recreational activities and is critically important in food production. Streams and rivers have also historically provided a readily available method of waste disposal. Collectively, all of these activities can be termed ‘ecosystem services’; services that are provided by the environment that often get taken for granted, yet would require great investment to replicate. The benefits and costs of these services are often poorly understood and hard to quantify, but at the end of the 20th century it was conservatively estimated that the biosphere performed US$33 trillion worth of services annually, compared to global GDP of US$18 trillion3. For most of Auckland’s development, however, ecosystem services have simply been taken for granted. All of these ecosystem services cannot be provided for simultaneously. A river or stream cannot harbour a food source while waste is disposed into it. An aquifer cannot provide clean drinking water if excess nutrients or industrial waste seeps into it. It requires a clear choice on our behalf as to what ecosystem services we value, and which ones we decide to do away with. And while rural New Zealand has seen extended debates about water quality in the last decade due to visual pollution in streams and rivers, what do we make of our freshwater resources in urban Auckland? Auckland is a wet city. Within our urban boundaries we have an average of 1,200 millimetres of rain per year (almost twice as much again in the Waitakere and Hunua ranges). This as about the same as Wellington, but more than Hamilton or Tauranga, and much more than Palmerston North, Queenstown, Christchurch or Dunedin4. Historically, freshwater in Auckland was the poorer cousin of marine water. We are conscious of pollution washing up on our city beaches and the swimming restrictions that get put in place following heavy rain. There are regular periods of the year when shellfish collection bans are active. But for too long we paid little attention to what we were doing to our streams. Granted, due to the geographic location of urban Auckland our streams are small. We are surrounded by coastlines so streams reach the sea before becoming large rivers. This small size means they were easy to turn into piped stormwater networks or concrete channels. And the underlying volcanic geology also means that plenty of local spots in Auckland can just let stormwater soak away into the fractured basalt and scoria beneath them5. Out of sight, out of mind. Where did this get us? Auckland’s historical attitude mirrors other cities. Increasing impervious surface areas within catchments is a major consequence of urbanisation. This in turn increases the volume of water running into streams during storms as less will soak into the ground. Flood peaks increase in terms of volume, the maximum flows-per-second and the absolute height above normal water levels6. Flood flows have more energy, scour banks more easily, have more erosive power and can carry more sediment7. Floods also happen more quickly, with less time observed between rainfall and flooding6. Outside of storm events, stream baseflows are reduced as there is less groundwater recharge. Freshwater ecosystems suffer, with reductions of in-stream biota and the emergence of pollution tolerant species8. Collectively, these effects have been called the ‘Urban Stream Syndrome’9. These effects are made complex as all streams are functions of the surrounding landscape and climate and therefore different7. These effects typically lead to an engineered response: extensive pipe networks, concreted stream channels that reduce erosion, straightened channels that increase the speed of flows and hence get floods ‘away’ quicker. Most of the natural waterways that existed pre-development within the current urban boundary have been modified. The historic centre of Auckland, the CBD and surrounding suburbs, has seen virtually all natural watercourses disappear into pipe networks. How many people know that Myers Park and the lower half of Queen Street was built over the Waihorotiu? Further away from the central city, later developments channelled streams into concrete chutes, one of the most easily accessible examples being the Wairau Stream on the North Shore. The increase in impervious areas also leads to increased pollution. Litter casually dropped on the streets is washed into stormwater when it rains10. Pollutants such as heavy metals and hydrocarbons are deposited on road surfaces from vehicle emissions, tyre wear and brake wear11. Galvanised and copper roofing leads to increased levels of zinc and copper in waterways12. Combined storm sewer systems are overloaded during heavy rainfall and spill into creeks or onto beaches13. While point sources of pollution such as individual factories are usually well regulated and measured now, historically it was common for industry to dispose of waste directly to local creeks and streams. The diffuse pollution sources listed above still remain an important and often poorly quantified source of contaminants14. Compounding all of this is climate change. Traditional stormwater pipe networks are designed be hydraulically efficient during large rainfall events, usually conveying the 1 in 5-year or 1 in 10-year flood. But our understanding of what these flood flows actually are will be affected by climate change. Some areas of New Zealand will get drier, some areas will get wetter15. Our estimates of what constitutes a 1 in 500-year flood event are based on limited periods of recorded rainfall, usually no more than 50 years. So, if rainfall patterns will change, how will our old infrastructure cope when it may not be designed for the flood of the future? Since the mid 1990’s there is increased recognition of the effects of urbanisation and there are many efforts underway to reduce our impacts (more to come on this in the next post). But the implications of our historic relationship with Auckland’s freshwater will take a long time to reverse. For too long our freshwater systems have been buried beneath us and removed from our sight. How do we value that which we cannot see? Auckland harvests freshwater to be treated and supplied as potable water. We take this water for granted as it arrives in our house, to drink and wash in. We dispose of it down the plughole, forgotten the moment it leaves our sight. How often do we make the connection between the rain that falls on our roof, the water that runs down the gutters and is whisked away in drains, and the water we consume from the tap? In the next post, I will look at the infrastructure changes that have come about in the last twenty years and the concepts of the Water Sensitive City1. In the meantime, how do you interact with freshwater in your daily life? Do you have a rainwater tank that you use to water the garden with (or drink from, if you live in a rural area)? Do you notice the kerbstones above catchpits in the road that say “Dump no waste, flows to sea” and then wonder where the stream is? Is freshwater only something that you notice when you’re outside Auckland on holiday, at a lake or river? Have you walked in the Waitakere and Hunua ranges and known you’re in the reservoir catchments? Or is your relationship with freshwater one that characterises it as an inconvenience: are your interactions limited to the nuisance of surface water flooding when a drain gets blocked during heavy rain, you or your kids weekend sport cancelled, or when you are caught out in a typical squally Auckland shower that descends from nowhere? An excellent article by Kennedy Warne with great photos by Arno Gasteiger recently appeared in New Zealand Geographic16, it is well worth a read as it neatly encapsulates the current water infrastructure issues facing Auckland and provides a thoughtful discussion of what changes we may need to make. Great post thanks. Looking forward to reading more. Thanks mate, hopefully the next one will be up soon. I agree very interesting post. I would love to have streams visible and people playing in them throughout the city – imagine how cool would that be in summer. We don’t let cows play in streams, why would we let people? They would erode the banks and pollute the water just like cows. People are generally a bit better toilet trained and don’t have nearly as much weight over each leg. Yep, we all love to head to the beach when it’s hot over summer, why not a local stream or swimming hole too? Thanks Ed – great coverage of an area that is often overlooked yet fundamental to the quality of our aquatic and marine environments. The orthodox approach to managing stormwater doesn’t really cut it anymore, and the momentum in NZ is shifting slowly towards ‘water sensitivity’ in line with the more progressive stance taken by some Australian cities. While not transport-related, the benefits provided by rainwater tanks, which are often couched solely in terms of reducing demand on mains supply (a noble objective), also extend to attenuating the “flashiness” or urban runoff due to their effect in detaining roof-derived storm flows, especially when plumbed into house supply for non-potable reuse (e.g. laundry and toilet flushing). When implemented on a large enough scale, rain tanks can also lead to greatly improved ecological conditions in waterways by moderating the flow regime. I look forward to the rest in your series. Hi Rueben, yeah you make good points. My next post deals with water sensitivity, I believe Auckland could be a world leader in this if we wanted to. Rainwater tanks are an excellent way of retaining water in the urban setting, both for domestic consumption and to moderate flows. Having moved to a location with no reticulated water a bit over 2 years ago, my relationship with fresh water has changed completely. Thankfully the previous owner was somewhat of a doomsdayer so we’ve got 2 connected tanks off the roof (20000L and 13000L), plus another 13000L off the garage which we can pump from if necessary, but this mainly gets used for watering the garden. Overall I see it as positive, during the winter we’ve got no shortage at all (and also no bills to pay to Watercare), but during the summer we’re really consicious of preserving our resource and are better off for it. Yep, sediment is a key pollutant that we don’t address enough during development. Auckland Council (together with industry participation) has been doing great work helping to develop sediment control guidelines, but the enthusiasm with which implementation occurs is mixed. Great article. I’d love to see what really good water management looks like on a small neighbourhood scale. A good cutting edge example of ‘integrated water management’ at a neighbourhood scale is the Aquarevo development in Victoria which aims for impressive reductions in potable water demand, improved flood management and great environmental outcomes, delivered through a pretty hi-tech system. For example, the rain tanks communicate with rain radars so the tanks can purge the volume necessary to accommodate roof runoff from the imminent storm to reduce the peak flows entering streams. It really acts on the “stormwater as a resource, not a liability” idea that is slowly taking hold. Nothing like a good dry spell to see the sense in that. That’s neat! Hadn’t seen that before, thanks Reuben. Daylighting streams is really important to Māori too. Though (like many such things) it’s just good for all of us. 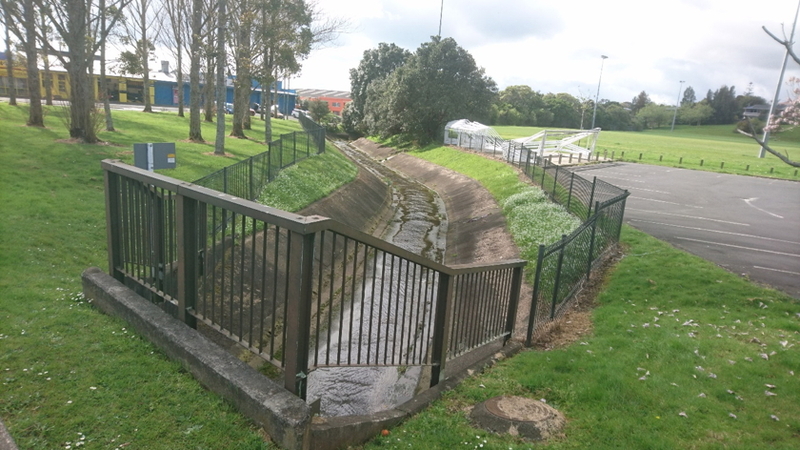 The fact that so many streams have been piped, buried, turned into drains and generally disrespected to hell is a sad testimony to the Pākehā planning and infrastructure establishment’s alienation from nature – and its willingness to push that on all of us. Yes, daylighting streams would be a great step forward. This winter I surveyed a stretch of our coastline, and noticed that where access for the public has been improved, so has the quality of the environment. I think local people having access has two obvious effects – they pick up the visible rubbish, and they provide oversight of others’ polluting activities. When it’s hidden away in drains, no-one can be the caretaker or whistleblower. Exactly, give people a sense of identity with where they live by giving them access. Yeah we definitely have the legacy of water only being interpreted as a health risk, hence the need to get it ‘away’. I hope that in the future we recognise the mauri of an area before we plan any developments, designing our urban spaces to live within the environment rather than on top of it. Interesting article, and I’m looking forward to the next. I don’t know about this, though: “All of these ecosystem services cannot be provided for simultaneously.” I’d have put that a little differently, but maybe that was your point? We can support the ecosystem to provide all the services – but of course we need to completely rethink transport, commerce and many technologies. Thanks Heidi. My point is that we can chose the ecosystem service(s) of providing food, water, transport, recreation etc, or we can chose the other major ecosystem service: to dispose of waste into water. So I guess I should rephrase slightly, we have to chose which services we prefer to have. You show a picture of an open stormwater drain with a fence. This is to keep children from harm, not because the water is considered dirty. Yeah, one message is ‘unsafe’ as I said in the caption. However, covert messages are always conveyed when people are visibly excluded from any area, be it private or public property. Given that when it rains a large volume of gross pollutants are transported through these channels, and that these can be seen deposited within the channel during low flow, the idea of ‘dirty’ water being not fit for contact is suggested by a fenced waterway. Real really interesting article. I have always had a fascination with streams. I recently contacted https://waicare.org.nz/Home.aspx to help out with monitoring but if there are any other ideas on how to get involved I’d be interested in your thoughts. Good on you. Many streams have a care organisation. They organise clean up days, weed removal days, planting days, etc. Your local library or local board should be able to help you find one. In your monitoring work or talking with the other volunteers, you might be able to get a good understanding of the local network, which parts of it are piped, which areas receive stormwater from paved areas, etc, and which areas receive sewage if there is a combined sewer in your area which overflows with heavy rain. Just building up a knowledge of the area will undoubtedly put you in good stead to be able to have input when a change in land use is proposed. Good stuff. As Heidi points out in her reply to you, there are many organisations around but they can be quite hard to find. Auckland Council is the best place to start to try and find them. Sorry I can’t be of more help, public engagement is not an area that I have pursued to date (! ), this post being the first I guess. My background is very much technical hydrology, analysis etc. Thanks Grant, hope you enjoy the others to come. Hi all, firstly thanks for all of the comments, secondly I apologise for my extremely slow responses! Have been away from a computer for the last few weeks. I’ll do my best to answer all of your posts/questions, will be faster when the next post goes up!